This is the DeeperBlue.com Beginners Guide to Scuba Diving. We’ve put this guide together to help budding Scuba Divers understand what is required to get started. Part 13 of this series takes a look at Drift Dives and Currents. Currents are a strong factor in the quality of many a dive. Many of the best dives in the world are drift dives. Divers will descend to a reef, position themselves near the wall, then join the current and let nature propel them along the face of a wall. The views are generally stunning, the marine life varied and often large pelagic like sharks, barracuda and tuna are doing the same thing you are, except they are shopping for dinner. At other locations, you lock yourself into a position and watch that parade go by. Or just drift slowly over a reef. There is a dark side of the force of a current. Divers can misjudge currents underwater and surface a distance away from their dive boats. The current can easily push them farther away and it does not take many minutes before they will be far enough away to be hard to see. Shore divers who misjudge currents can be prevented from returning to shore. Search and rescue activities for divers lost due to currents are not uncommon. Diving with currents is something some divers look forward to with excitement and others with dread even fear. Like many aspects of diving, having a basic understanding and a little practice will greatly help you. When you have progressed in your diving skills and have your buoyancy under control your first drift dive will be something to look forward to. Before we get into that, lets cover some basic things about currents. Currents is a flow of water, it can be localized such as a rip current, broad like the tides or water movement of a river. The strength of the current is expressed by its speed in knots, which means nautical mile per hour. A nautical mile is equal to 1.15 miles. The US Navy did an experiment in the 1950s using experienced underwater demolition teams. One of the elements tested was the speed they were comfortable maintaining for a long steady duration. The results ranged from .7 Knots to 1 knot, with the mean speed at .8 knots (same number of divers faster as slower). On land, The average person walks at about 3 miles per hour or about 2.6 knots. Diver propulsion vehicles (DPV) used by recreational divers also have a top speed of about 2.6 knots. If you have seen divers underwater using these, that 2.6 knots would have seen fast to you. The density of water is greater than air and we are nearly neutrally weighted in water, this combination means the force of the water has a greater impact. On land, a wind speed of 10 knots would be needed for most flags to fully extend, so that you can see the entire flag and it is parallel to the ground. While stationary on a down line, a current of just one half a knot, would cause us to become horizontal like the flag. Adjusting your equipment at or near the surface can be difficult in a current. A mere 1 knot current underwater, is enough to break a seal on your mask and causing it to flood when you turn your head. At two knots, letting go of the down line to adjust the mask will take you out of reach of it when you are done. There is no universal definition of currents, but it not uncommon to see 1 knot and less shown as mild, 1 to 3 knots as moderate, 3 to 5 knots as strong and over 5 knots as severe. Another point to remember, is that a current can change depths and take an unwary diver very deep. There will be times when you arrive at a reef or wreck dive site and discover that there is a current. A mild current should not affect your diving greatly. However, it might mean that you will need to change your dive plan. A surface current might require that the dive boat put out an additional line for divers to hold on to get to the descent line. It will also help divers from drifting away when they surface and are waiting to get back on the boat. Surface current does not automatically mean that there is a current at your diving depth, or that it is in the same direction. When you descend to your dive site, orientate yourself well. Look for features that you will be able to use to locate yourself later. Sites with a varied profile may have places where there is less or no current. A hull of a ship may block the current leaving a relatively current free diving zone, much like hiding behind a building to get out of the wind. If you must dive with currents, start your dive against the current. You will have the greatest energy at the beginning of the dive. Remember the example of the Navy demolition teams could only sustain less than a knot for long periods. Situational awareness, that is being aware of what is around you, is a key factor here. As you swim against the current, its direction may change. This means turning 180 degrees will not bring you back to your starting point. As you swim into the current, look back at times to see the view as it will be on your return. You may have heard already the diver’s rule of thirds. It is a keystone of cave diving and applies to wreck penetration diving as well. The rule is to plan your dive so you use 1/3 of your breathing gases supply on the way in and 1/3 is used to get out. The final 1/3 is a reserve and to return to the surface. Until you are very comfortable in currents, it is a good practice to apply the rule of thirds. Use 1/3 of your air to swim away from your descent point. Pay close attention to your gauges because you will likely use air faster that you normally do. Once you have reached your 1/3 point, turned back towards your descent point. As the current will be pushing you along, the return time will be shorter. 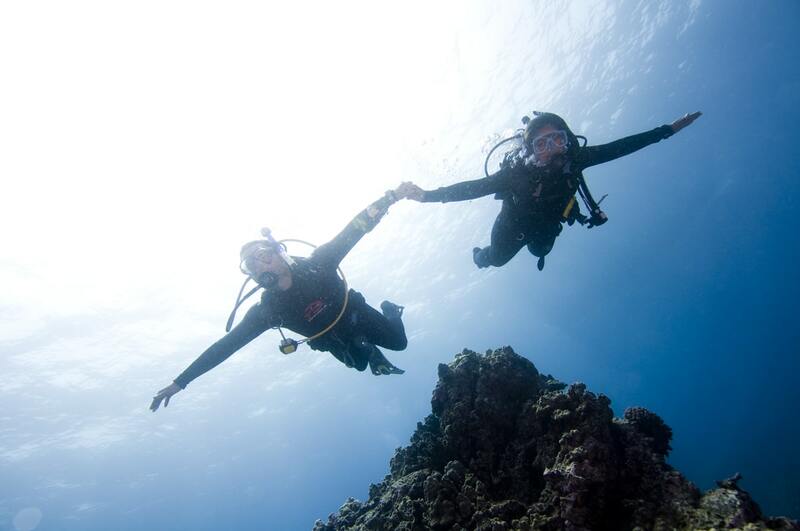 Once you have located your descent point you can use the rest of your gases as you would on any normal dive. Just stay relatively close to the descent point and up current. When you ascend, maintain contact with the line. If you are unable to locate the line or drift away from it, deploy your Delayed Surface Marker Buoy (DSMB) and start your ascent. The DSMB is another tool originally used by technical divers but have been widely adapted by recreational divers. They are a tube with a line attached that you add air to underwater. It then is released to float to the surface. When it reaches the surface it stands above the surface and it easy to see. Release the buoy as soon as you know you will not surface on the line. This will give the boat crew more time to see the buoy. Having them see the buoy does not mean they will be waiting for you as they have other divers relying on them being where they dropped anchor. You will learn about using DSMB and the Surface Marker Buoy (SMB) in your open water training. While you should always have a surface signaling device, it more important when diving currents. A Drift dive can be very exciting, however, it requires a good boat crew. The basic concept of a drift dive is the opposite that of diving a fix location that has a current. Instead of diving into the current and then using the current to return to the boat, a drift dive has the divers allowing the current to propel them and the boat follows. Channels between land masses make great locations when there is a current running, The change of tide across a reef, or a current that deflects to follow a wall along a reef are also excellent choices. The dive planning takes on some different key points for drift diving. In your normal dive planning, there is an over all site plan and the individual dive teams make adjustments to their dive plans to adapted the site to their experiences and expectations. Drift dives require that all dive teams keep the same dive profile. Currents are not consistent at various depths. A 1 knot surface current headed at 0°, may change to a 3 knot current headed at 90° at 33 feet/ 10 meters. It may change to another direction as you go deeper. So the dive plan will need to have a depth that each buddy team is comfortable with. A common procedure will have the dive teams assemble at the desired depth following a drop line down. As a dive team releases from the drop line and allows the current to propel them, they inflate their DSMB. When the boat crew sees the proper number of DSMB on the surface, they can retrieve the drop line and follow. They will then maintain an up current location of the divers. A strong surface current, might require a negative buoyancy descent. This is a skill that should be practice without a current before using it in current. A buddy team enters the water together and with no air in their BCD’s. The inertia of the entry and negative buoyancy will cause them to rapidly descend. They need to adjust their buoyancy to become neutral buoyant at the depth desired. The buddies need to descent at the same rate to remain together, and frequently equalize. A buddy team needs to stay together, and each buddy have their own DSMB, in case of separation. The different dive teams may separate, as long as they are at the same depth, they will all be going in the same direction and be easy to located by the dive boat. As we do our dive planning, the presence of a Severe and other Dangerous Currents should be known to us. There may be time where we encounter one unexpectedly. Swimming into a rip current on a shore dive or having the current we are following suddenly go deep are examples we might come across. Going with the flow may not be the safest advice in these situations. Remember never try to fight against the current. The demolition experts felt .8 knots was the best they could do for a longer duration. Currents of these types are generally narrow, so it may be best to try to work towards the outside of the current. Maintaining your trim is important, if you expose more body surface to the current it will have a greater effect on you. While a drift dive is a wonderful experience, the easy movement and the speed are not the only attraction to currents. Currents, especially those that rise from the deep, carry nutrients that will help create locations rich in marine life. Currents are the food delivery system to the lower levels of life in the sea. Corals will open wide in a current to take in the nutrients it needs, Small fish will come out of hiding to eat. Larger fish and pelagic are attracted by the increase in smaller fish. When you are doing a drift dive in a current, you will also be experiencing this food chain exploitation of the increase nutrients. great article! nice! thanks for sharing!